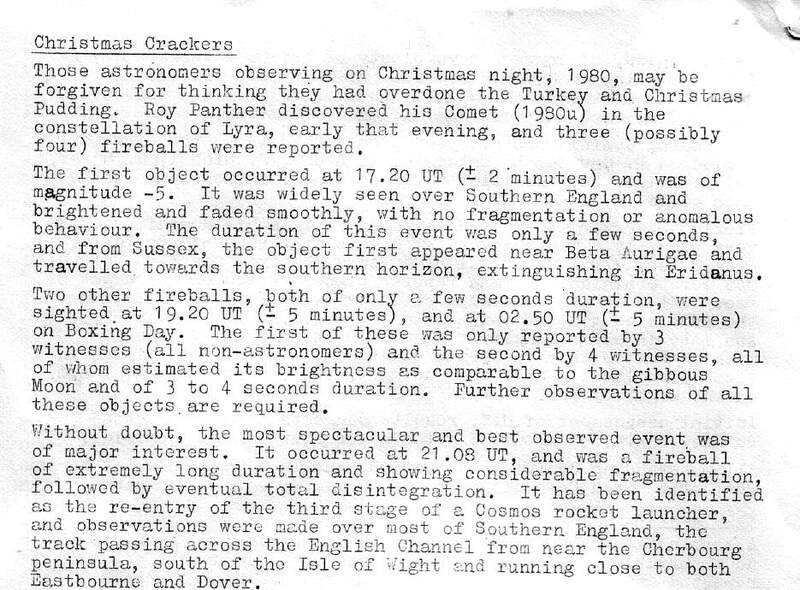 Hard to believe, but it wasn't space aliens that caused blinking lights in Rendlesham Forest in 1980. The Sci-Fi Channel calls it the most comprehensive cover-up in the history of Britain. It's often called the most important UFO incident of the 20th century. Imagine, alien spacecraft drifting through the woods on the perimeter of a US Air Force Base in England, shining their colored lights around in plain view of pursuing military security personnel, for three nights in a row. And how did the United Kingdom and the United States react to this obvious threat to their nuclear arsenals? They didn't. There's no wonder the Rendlesham Forest UFO Incident is the one that UFOlogists consider the most frightening. Two old Royal Air Force airfields, RAF Bentwaters and RAF Woodbridge, are situated just two miles apart near the eastern coast of England. Throughout the cold war they were operated by the United States Air Force. On the night of Christmas Day, December 25, 1980, personnel at the base reported bright UFOs streaking through the sky. 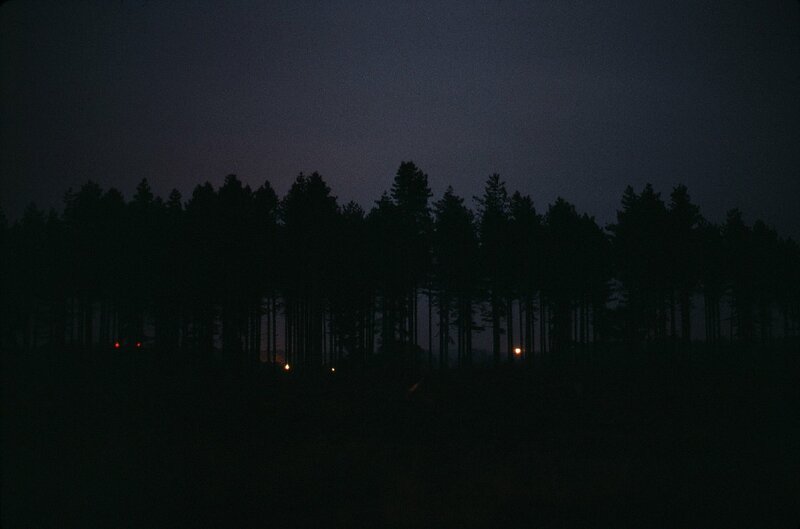 Later that night, in the wee hours of December 26, security personnel from RAF Woodbridge entered Rendlesham Forest to investigate some strange, pulsating, colored lights moving through the trees, that they thought at first might be a downed aircraft. Local constables were called and also participated in the observation. Base personnel described the craft they pursued as metal and conical, with a bright red light above and a circle of blue lights below, and suspended in a yellow mist. By daylight, they located a clearing where they thought the strangely lit craft had set down, and found three depressions in the ground in a triangular pattern. The constables were called again and photographed and confirmed the landing site. Two nights later in the wee hours of December 28, they returned to the site, led by Lt. Colonel Charles Halt, second in command at the base. They brought a radiation detector and recorded high levels of radiation at the landing site, again observed the colored, pulsating lights through the trees, and again pursued them through the forest. Other colored lights were seen flying through the sky. Col. Halt recorded the audio of this pursuit on a microcassette. Two weeks later, after debriefing all of his men who participated, he wrote down the specifics of the episode in a signed memo titled "Unexplained Lights", and sent it in to the British Ministry of Defense. Ever since, the airmen involved claim to have been coerced to change their stories and deny that anything happened, and were threatened with comments like "bullets are cheap." Wow. That story is really something, isn't it? But even more impressive than the story is the documentation, mainly Col. Halt's audio recording and signed memo. You don't rise to be deputy commander of a United States Air Force base with nuclear weapons if you're a nutcase, and when you're accompanied by local police constables and a number of Air Force security personnel who all file written reports, you don't exactly make up ridiculous stories. There's little doubt that Rendlesham Forest probably has the best, most reliable evidence of any popular UFO story. Ever since I first heard about the Rendlesham Forest incident, I've been as curious as anyone to know what actually happened. So I decided to begin with the null hypothesis — that nothing extraordinary happened — and then examine each piece of evidence that something extraordinary did happen, individually, on its own merit. I wanted to see if we could find a natural explanation for each piece of evidence: You always have to eliminate terrestrial explanations before you can consider the extraterrestrial. At [about 3am], me and five other guys were walking up a dark path about 2 miles from base... Then we saw a bright light go right over us about 50 feet up and just fly over a field. It was silent. At the same time on base, a security patrolman was dispatched to check the weapons storage area to see if a "falling star" had hit it. It had not. But it does seem clear that all of the UFO reports from the base are perfectly consistent with known meteor activity on that night. So much for the UFO sightings. Next piece of evidence. Airmen at the east end of RAF Woodbridge went into the forest to investigate a strange, pulsing, colored light that they suspected might be a downed aircraft. We have the signed statements of the three men who went into the forest, SSgt. Penniston and Airmen Cabansag and Burroughs, as well as that of their superior, Lt. Buran. At this point it's important to know the geography of the area. Heading east from the east gate of RAF Woodbridge, there is about one mile of forest, followed by an open farmer's field several acres in size. At the far end of that field is a farmhouse. A little more than 5 miles beyond that sits the Orfordness lighthouse, in a direct line of sight. Although the three men stayed together, their reports are dramatically different. Penniston and Burroughs reported moving lights of different colors, that they felt came from a mechanical object with a red light on top and blue lights below surrounded by a yellow haze. They even drew pictures of it in their reports, but Penniston's illustration of their best view of it shows it partially obscured by trees and well off in the distance to the east. Burroughs' drawing of the object is based on Penniston's description, as Burroughs himself only reported seeing lights. Cabansag, however, reported that the only light they saw after actually leaving the base was the one that all three men eventually identified as a lighthouse or beacon beyond the farmhouse. Cabansag reported that the yellow haze had simply been the glow from the farmhouse lights. Once they reached the field, they turned around and returned to base without further incident. A further problem with Burroughs' and Penniston's stories is that they have grown substantially over time, particularly Penniston's. In more recent TV interviews, they've both claimed that they saw the craft fly up out of the trees and fly around. Penniston has also unveiled a notebook which he claims he wrote during their forest chase, which he displayed on a 2003 Sci-Fi Channel documentary. Its times and dates are wrong, and Burroughs has stated that Penniston did not make any notes during the episode and would not have had time to even if he'd wanted. Penniston's story has also expanded to include a 45 minute personal walkaround inspection of the object during which he took a whole roll of photographs (seized by the the Air Force, of course), which from the written statements of all three men, is a clear fabrication. There was absolutely nothing in the woods. We could see lights in the distance and it appeared unusual as it was a sweeping light, (we did not know about the lighthouse on the coast at the time). We also saw some strange colored lights in the distance but were unable to determine what they were... Contrary to what some people assert, at the time almost none of us knew there was a lighthouse at Orford Ness. Remember, the vast majority of folks involved were young people, 19, 20, 25 years old. Consequently it wasn't something most of the troops were cognizant of. That's one reason the lights appeared interesting or out of the ordinary to some people. Air traffic control West Drayton checked. No knowledge of aircraft. Reports received of aerial phenomena over southern England during the night. Only lights visible this area was from Orford light house. Search made of area - negative. So much for unusual lights or strange flying craft reported by the airmen in the forest on the first night. There were three marks in the area which did not follow a set pattern. The impressions made by the marks were of no depth and could have been made by an animal. He recognized them as rabbit diggings, several months old and covered with a layer of fallen pine needles... 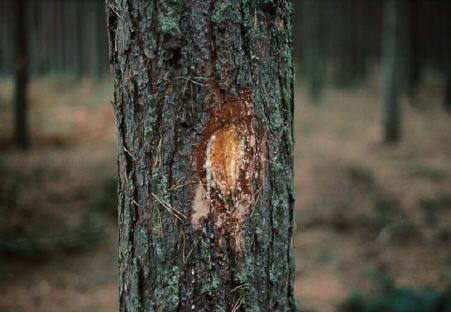 The "burn marks" on the trees were axe cuts in the bark, made by the foresters themselves as a sign that the trees were ready to be felled. So much for the landing site. Col. Halt: "Up to seven tenths? Or seven units, let's call it, on the point five scale." He used a standard issue AN-PDR 27 Survey Meter, which detects beta and gamma radiation. The highest level reported by Col. Halt on his audio tape, "seven tenths", corresponded to .07 milliroentgens per hour, just at the lowest reading on the bottom range of the meter, the "point five scale". The UK's National Radiological Protection Board (NRPB) told Ian Ridpath that levels between .05 and .1 mR/h were normal background levels; however, this particular meter was designed to measure much higher levels of radiation and so it was "not credible" to establish a level of only ten times normal background. So much for Col. Halt's radiation. Col. Halt: "You just saw a light? Where? Slow down. Where?" Unidentified: "Right on this position here. Straight ahead, in between the trees – there it is again. Watch – straight ahead, off my flashlight there, sir. There it is." Col. Halt: "I see it, too. What is it?" Unidentified: "We don’t know, sir." Col. Halt: "It’s a strange, small red light." Although several times during the tape Col. Halt calls the light red, he is contradicted by his men who say it's yellow. In photographs of the 1980 light taken before it was replaced, it did indeed look orange. Even the new light, which is mercury vapor discharge and therefore whiter and bluer than the original incandescent, appears distinctly red in photographs and video when viewed from Rendlesham forest. Col. Halt, having been in the area longer than most of the young servicemen, did know about the lighthouse; but he didn't think this light could be it because it was coming from the east. Col. Halt believed the lighthouse was to the southeast. This is true from RAF Bentwaters, where Halt was from. But the chase through the forest proceeded due east from RAF Woodbridge — two miles south of Bentwaters — and from there, unknown to Col. Halt, Orfordness lighthouse is indeed due east. Col. Halt: "We've passed the farmer's house and are crossing the next field and now we have multiple sightings of up to five lights with a similar shape and all but they seem to be steady now rather than a pulsating or glow with a red flash." Five steady lights glowing red. The Orfordness Transmitting Station is just two miles up the coast from the lighthouse, and features five tall radio towers topped with red lights. Col. Halt's thoroughness was commendable, but even he can be mistaken. Without exception, everything he reported on his audiotape and in his written memo has a perfectly rational and unremarkable explanation. And with that, we're nearly out of evidence to examine. All that remains is the tale that the men were debriefed and ordered never to mention the event, and warned that "bullets are cheap". Well, as we've seen on television, the men all talk quite freely about it, and even Col. Halt says that to this day nobody has ever debriefed him. So this appears to be just another dramatic invention for television, perhaps from one of the men who have expanded their stories over the years. When you examine each piece of evidence separately on its own merit, you avoid the trap of pattern matching and finding correlations where none exist. The meteors had nothing to do with the lighthouse or the rabbit diggings, but when you hear all three stories told together, it's easy to conclude (as did the airmen) that the light overhead became an alien spacecraft in the forest. Always remember: Separate pieces of poor evidence don't aggregate together into a single piece of good evidence. You can stack cowpies as high as you want, but they won't turn into a bar of gold. Army. Radiac Set AN/PDR-27. Washingon, DC: United States Army, 1952. 12. Kelly, Lynne. The Skeptics Guide to the Paranormal. New York: Thunder's Mouth Press, 2004. Pages 198-201. Rutkowski, C. A World of UFO's. Toronto: Canada Council for the Arts, 2008. 27-32.